You can have a full smile again without removable dentures. Implant supported dentures give you the complete smile restoration of dentures with the permanence of dental implants. At Ora Dentistry, we offer a wide variety of restorative options, including dental implants, dentures and implant supported dentures. For many, the combination of implants and dentures makes the best sense for their needs and budget. Conventional dentures are held in place by adhesives. This is not always effective and can be unappealing. With implant supported dentures, surgically placed posts in your jaw connect to your dentures. This holds them securely in place. 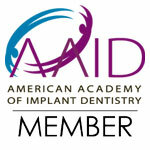 This design is more comfortable and reliable for our patients than conventional dentures. Wearers do not need to worry about their dentures slipping when they are talking or eating, giving them more confidence in social situations. There are several different options available in implant supported dentures, with different levels of permanence, comfort and affordability. To determine if you are a good candidate for implant dentures, a thorough exam must be performed by an expert in implant dentistry. Dr. Dalla is an experienced implant dentist and can evaluate your oral health and bone structure for implants. Sufficient bone in the jaw is required for dental implants. In some cases, a bone graft may be recommended to secure the implants. However, we also offer implant supported dentures that are specifically ideal for those that would usually require a bone graft for implants. For those that cannot support dental implants, we also have beautiful, modern dentures that are a good alternative. Find out if implant supported dentures are a good option for restoring your smile. Contact Ora Dentistry today to schedule a consultation for restoring your smile with Dr. Dalla. We have payment and financing options for your convenience.